Why should I practice Technique? Isn’t it a waste of time and much better to practice songs instead? Whenever I heard that argument I used to throw my hands up and say – I don’t even know where to begin! it tends to have a bad rap in the electric bass world. When I studied classical upright, piano, flute and the others, there was no question about the value of practicing technique. Some teachers would even go to such great lengths that they would forbid any kind of “song” playing until a technique milestone was reached. Now that, in my book, is overdoing the importance of technique a bit. my teachers had this terrible contraption that they would hang around my neck (it was made of paper that would connect to the book on the piano so the student could not see the fingers on the keys! It was a bit of a torture, and what they had me play in that book did not sound very good to boot. But it did help me find my keys without looking very fast and effectively. How can we do useful tech exercises, keep them fun, musical, applicable and practical? 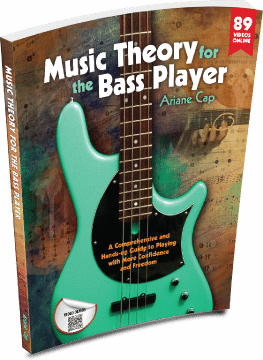 The featured image of this post is from my book, Music Theory for the Bass Player – yes, it is a theory book, but when talking theory on the fretboard it is prudent to do these fingerings with good technique, so there is lots of technique info in the book. Good bass technique in my view can be summarized by following a few simple principles. We are all built differently so some details vary from person to person, while others stay the same and are quite accessible – check out this handy learn-graph!. To change bad habits fast and effectively, check out my PORA technique. Technique practice does not need to be complicated! As Nike says – Just do it! To practice technique systematically with me (just pop in the video and practice along) check out the Finger Kung Fu section of my Course, Music Theory for the Bass Player; 20 units chock full of technique, theory and bass line creation! Wow, I thought guitarists (at least the ones not into shredding) were the only ones who argue for just playing songs.